SUBHEAD: Getting ready for a sustainable lifestyle takes more practice than most people suspect. 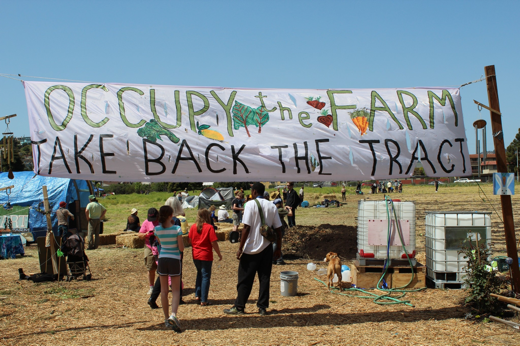 Image above: "Occupy the Farm - Take Back the Tract". From a film "The Wisdom to Survive: Climate Change, Capitalism & Community" From (http://www.spiritualityandpractice.com/films/reviews/view/27313). Green Philosophy towards nature, spirit, art and politics. part journal of fiction and even environmental newsletter. The area we focused on was within what used to be called "courtin' distance" to our place in Panama, New York. "Courtin' distance" was how far a boy might travel to visit a girl and get back home to finish his chores before dinner. We thought that covered an area of about 50 square miles. A lot of that area around our place was either state conservation land, trailers on old lots, and Amish or "English" farms. Some gravel covered roads near us had no power or telephone lines. You might see a horse and buggy there. The point is that that is where we are headed back to - that is if we can survive the times we are in right now. Printed local publications, some telephone and maybe even telegraph communication. If we're lucky there will be some ham radios left too. What there will not be are high resolution small portable screens with stereo sound and motion and touch detection that absorb hours of our days and know more about us than we do. We will more likely be using those Samsungs, iPhones and tablets for drink coasters and sushi plates. Here in Hawaii, where there is close ground water (until the rain cycle fails,) all the added sunlight, humidity and CO2 which have created an environment that is causing the plants to grow like crazy. Find a place and grow food now! The moral of the story is to start growing as much food as you can immediately. Don't wait for the kids to be gone or retirement. Don't wait for the money to buy that homestead or farm. Join a community garden or start one. We are getting closer to that time when the shipping containers crossing the the Pacific (on the water or in the air) won't be coming cheaply and reliably. When that occurs we will really be on our own. A worldwide reset is on the way. When completed there will be far fewer people and much less available energy for getting work done. We will all be on our way to a life like the indigenous Hawaiians or the faithful Amish. We will all be on a path back to something like the 17th to 19th century - if we're lucky. And it is going to take quite a bit of practice to get along in that world. Getting a headstart is not only fair, it is required. Hone your skills. As Dmitry Orlov said on several occasions "Collapse now and avoid the rush!" Below is a video of a talk given by Orlov about that subject (less than two weeks after "3/11" the Fukushima Daiichi triple meltdown). Video above: "The Wisdom to Survive: Climate Change, Capitalism & Community". From (https://youtu.be/7QLIOuRS1n4). Video above: "The Collapse -Dmitry Orlov". From (https://youtu.be/Ecfxl1wZDpE).